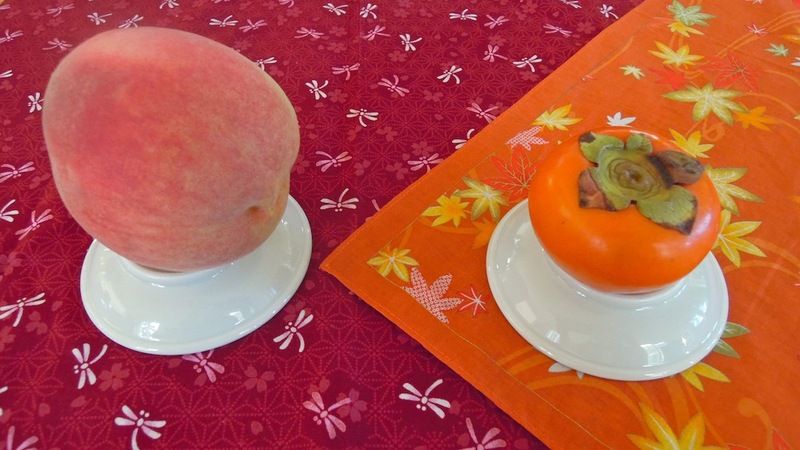 When I arrived in steamy, hot Kyoto in early September, I fell into a torrid summer romance – with white peaches. I was consumed with these perfumed, seductive, satisfying, luscious orbs. 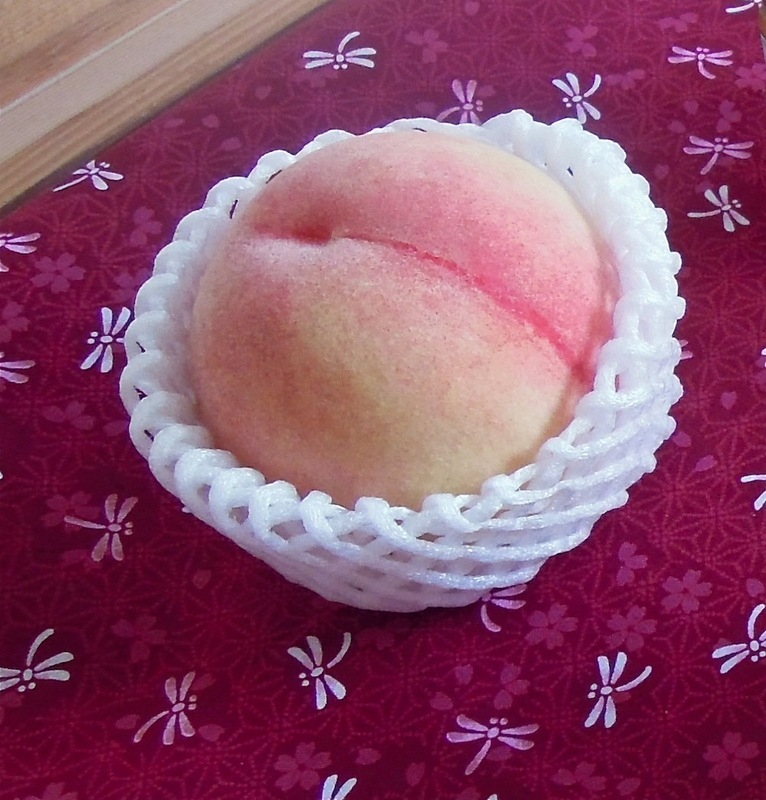 Each white peach is treated like a luxury item in Japan, a queen, whose head rests on a lacy ruffled collar. I’m from California, where we certainly grow peaches and I’m a loyal farmers’ market shopper. But buying peaches at home is a hit-or-miss-affair. Sometimes they’re hard, or mushy, or worst of all: mealy. 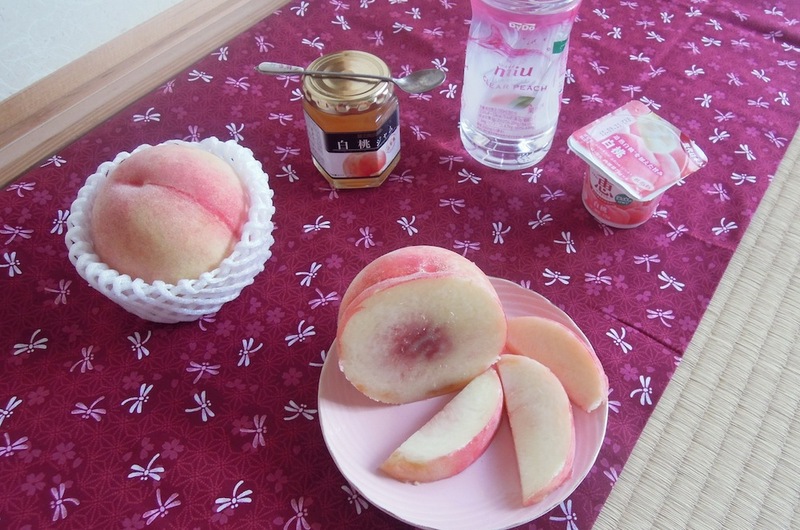 In Japan, by contrast, every single white peach I ate was perfectly sweet, ripe, ready for eating, the essence of summer. 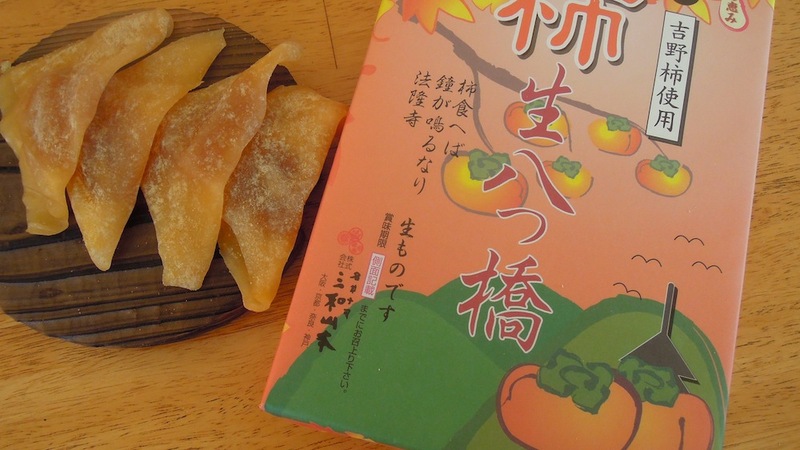 A bit of research turned up the reason behind this perfection: the loving care peaches receive in their birthplace, Okayama, where they are individually wrapped in little bags while still on the tree. My peach passion spilled beyond the fruit itself. I devoured white peach yogurt and jam, guzzled white peach smoothies and branched out to white peach flavored water, candy, even lip gloss. I told you I was obsessed. Then, about a week later, in the middle of September, I noticed a subtle shift, but not in the weather, which remained unrelentingly hot. No, the change I noticed was in product packaging. All of a sudden, radiant rust and golden autumn leaves appeared everywhere, on candy containers, bento boxes and store displays. 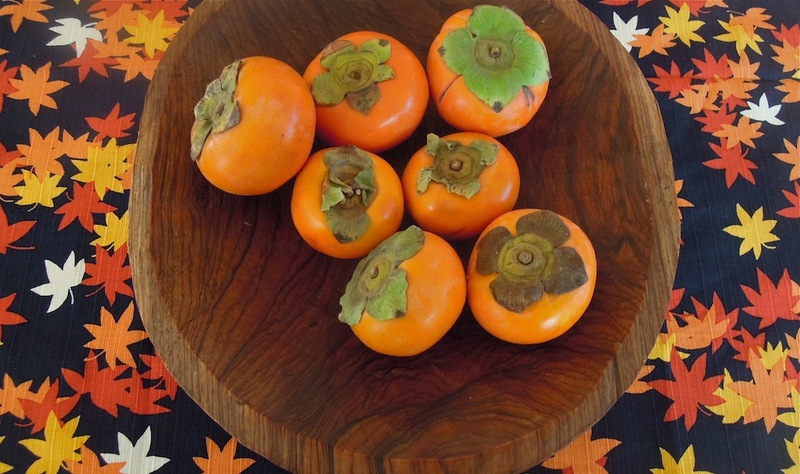 And at my local market, glowing orange persimmons (my favorite fall fruit) made their shy debut. This punctuation between peach and persimmon may have coincided with Tsukimi, the Moon Viewing Ceremony, an intriguing event I attended that heralds the coming of autumn. 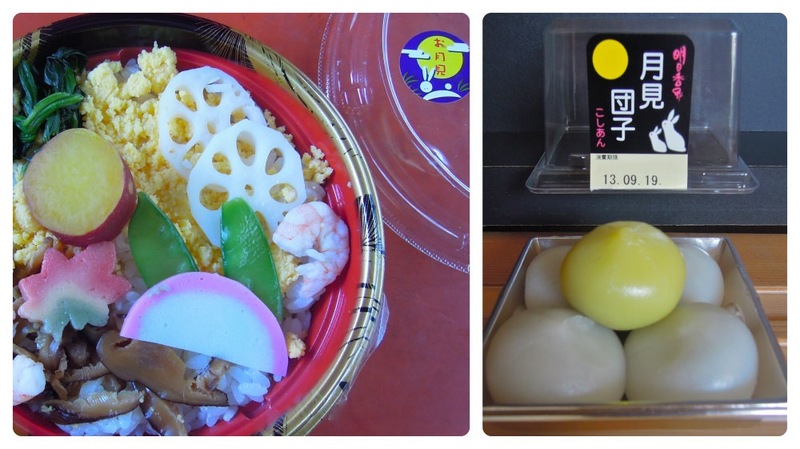 As usual, special foods are involved: tsukimi dango, moon-shaped sweets, plus moon themed salads and noodles. I even heard that Japan’s Mc Donald’s featured a “moon burger” with the addition of a fried egg. 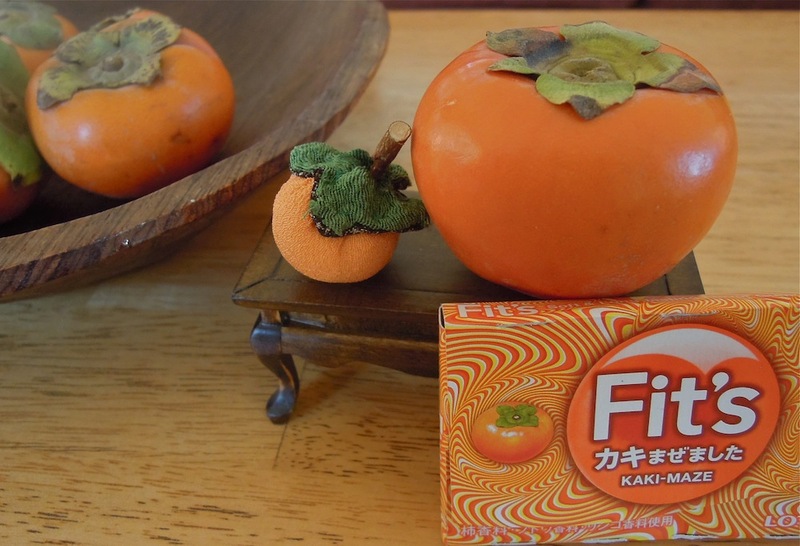 It was the night of the Autumn Moon Viewing that I started to notice the profusion of persimmon-themed sweets. And had the Best. 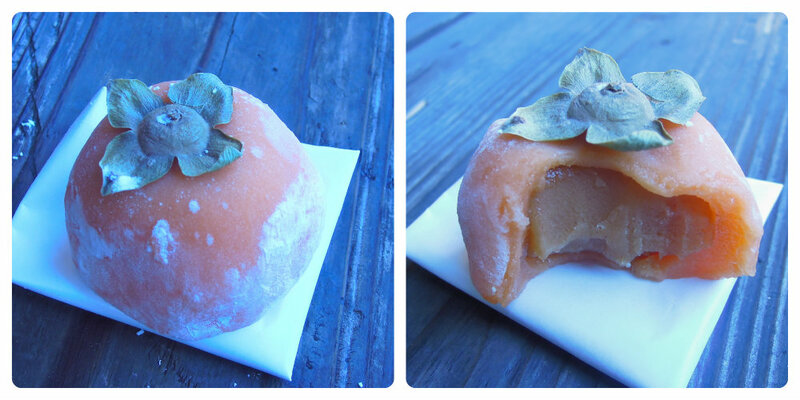 Persimmon Mochi. Ever. And as I transitioned my taste buds from peaches to persimmons, during the last week in September, several Japanese friends mentioned the concept of “shun” and told me it was a hard one to translate in English. Immediately, my interest was piqued, as those hard to translate words often carry keys to culture. The first instance occurred during my sushi-focused day, when Koichi, my Kansai guide, erupted in delight upon spotting a silvery fish for sale in the market. That fresh sanma (Pacific saury) seemed to be a harbinger of autumn. He bought a pair to make for dinner and couldn’t wait to show his wife. He said she would be so excited — to see a fish — and she was. Then my friend Keiko took me out to dinner at Kitchen Raku Raku, a unique little spot where we trusted the chef, with brilliant results. Chef Akira Mizobuchi started us off with a “surprise salad,” his artful combination with avocado, tofu, mushrooms and goya (Okinawan “bitter melon” that the chef transformed into delectable, golden fried crescents). As Keiko and I finished off the shared salad, she excitedly pointed to a little brown nub and exclaimed, “Ohh, look! kuri! (chestnut) Shun!” Then she tried to explain the meaning of “shun“. Not really “at the height of the season” but just at the beginning. There is also a word to describe the celebration of seasonal food at its peak, as there is no equivalent in English: shun. This word describes the exact moment that a vegetable is at its very best, a fruit at its most succulently sweet, fish at its most flavorful. Serious chefs take great pride in the celebration of shun, and it is central to the culinary world. This entry was posted in desserts and sweets, Japan, Japanese food and tagged Japan, kaki, Kitchen Raku Raku, Kyoto, momo, persimmons, seasons, white peaches. Bookmark the permalink.